There's a lot of talk these days about "handcrafted goods." But custom framing is truly a handcrafted business - each hand working together to bring your art to life. In our Meet The Team series, we're offering a glimpse into the minds and personalities of the people behind the craft. If you don't hear us say it enough, our team is amazing. The diverse collection of individuals, from framing consultants and fitting specialists to our delivery and installation team, all share an artistic sensibility but each with their own unique perspective. These expositions are part backstory and part just for fun (each person will also answer a few questions from the Proust questionnaire, a parlor game popularized by French novelist Marcel Proust who believed that answering these questions reveals an individual's true nature). It's our hope that through this series you'll forge a deeper connection with the makers behind the frame and learn a little more about how we do things at AFS. Up next: River North showroom manager, Alex - a Texas native and artist himself whose film and video minor from the School Of The Art Institute comes in handy for movie night trivia games. 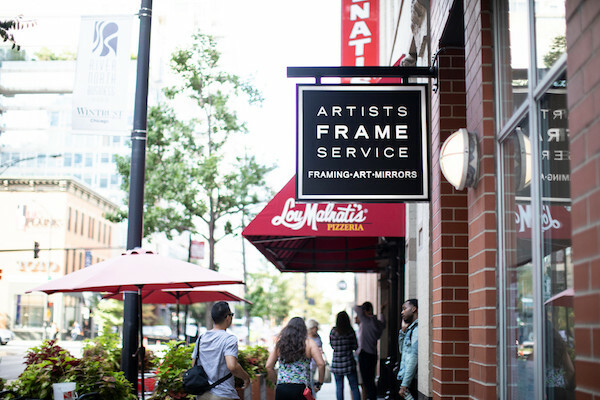 What's your favorite part about working at Artists Frame Service? For me, it's the resources. As a framer for the past almost decade, I've worked in numerous workshops and have experienced that certain ideas can be limited to the resources available. It could be with an interior designer, an avid art collector, or someone who's never had something custom framed before. Many projects involve a bit of problem solving. At AFS, we're not limited by lack of space, access to all types of materials and of course the resources, tools and knowledge of the team here. I believe we can accomplish just about anything unless - of course - it's physically impossible. AFS River North just opened this past summer - what do you love most about working in this neighborhood? Being in the design district in Chicago means that people, in their various creative fields, are looking for ways to see their ideas and visions to fruition. And now I get to be a part of that. It's also really great people watching. Most unique thing you've ever helped someone frame? Many years ago someone brought me an unopened bag of Cheetos that had all of the branding and info painted over with tempera. I'm still unsure as to the meaning behind that. My customer wanted it suspended within the frame and the ability to see both sides of the art. My problem was figuring out how to suspend it without any adhesives touching the surface of the tempera paint. I used an existing pinhole from where it was originally hammered to a wall to string a 4" fishing line through the top of the frame. Most unique thing you've ever framed for yourself? My father gave me a two-color letterpress poster promoting a Mexican masked wrestling fight that took place in Mexico City in 1975 between "El Santo" and "Perro Aguayo." These posters were made as throwaways but they're so vivid and eye-catching. I love the minimal color and obvious lack of room on the page to cram in all of the visual info for the event. There's a real sense of haste in the craftsmanship that I think any working artist can relate to. I wish I could draw using my non-dominant hand. My most treasured possession is my collection of art books. I have a lot. Meet more of our team here, or come in and see us in person in River North!